iHawk is a robot doctor who works as a medic in the DOOP Army in the war against Spheron 1. He has two settings: Irreverent and maudlin. Irreverent makes him tell jokes and make fun of people, maudlin makes him unhappy about war. 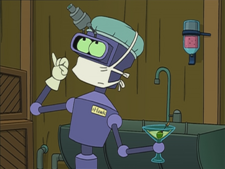 One of his hands is replaced by a martini holder and his name is written on his chest. He frequently argues with Zoidberg when in Irreverent mode as he thinks he is a better doctor and funnier- and given what is known of Zoidberg, he probably is. iHawk may be related to iZac. His name is in obvious parody of Benjamin Franklin "Hawkeye" Pierce of M*A*S*H*, and his voice is a dead-on impression of Alan Alda, who played the character. Additionally when he says "Dis isn't war, it's a moider", he says it like Groucho Marx, who Hawkeye was known to imitate. His name follows the pattern (and parodies) of many Apple products, which insert a lower-case "i" before a common word to make a product name. iZac is another example. Jellyfish nurse: Dr. Zoidberg has twice the training you do. iHawk: Yeah, he's a doctor and a butcher. [Switches to maudlin.] When will the killing end? Jellyfish nurse: Are you ready to operate doctor? iHawk: I'd love to, but first I need to perform surgery. Zoidberg: [angrily] That's my joke! I'll kill you! iHawk: Jeez Zoidberg, leave some for the enemy to kill. iHawk: [maudlin] This isn't a war. It's a murder. [Switches to irreverent, now imitating Groucho Marx] Dis isn't a war. It's a moider! This page was last edited on 14 September 2016, at 21:02.